Karankasso – further exploration optionality for Sarama. 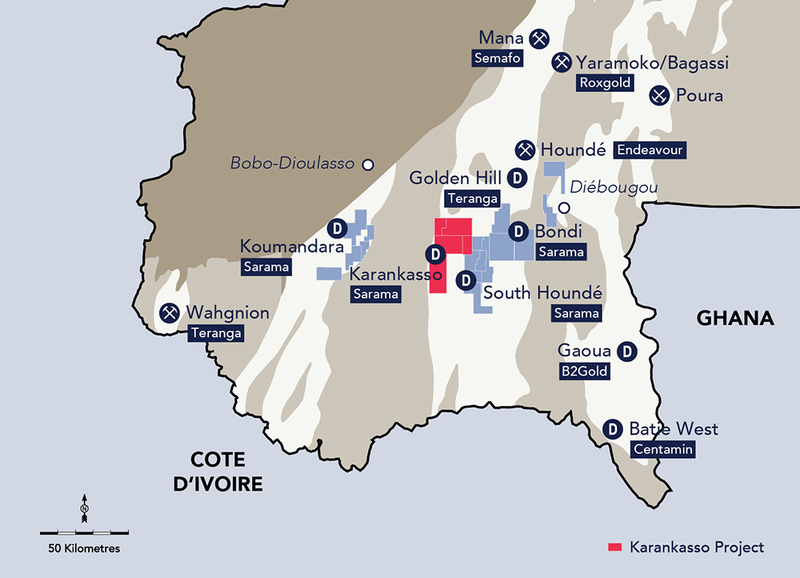 The Karankasso Project covers approximately 750km2 and is situated adjacent to Sarama’s South Houndé Project. Exploration is focused on a 50km long corridor defined by soil anomalies and artisanal workings. Sarama holds a 27% interest in the project, enhancing the company’s presence in the region. The project is situated 130km southwest of Semafo’s Mana Mine, Roxgold’s Yaramoko Mine and 60km south of Endeavour Mining’s Houndé Mine. A maiden Inferred Mineral Resource of 9.2 Mt @ 2.3 g/t Au at a 0.5 g/t gold cut-off(1) was published in 2015 and further exploration work has been undertaken since that time. Testing of exploration targets is ongoing with most mineralisation presenting as narrow quartz veins, and exploration efforts are seeking to identify areas where mineralised volumes increase and identify the core of the system. Further project and geological information can be found in the NI 43-101 Technical Report for the Karankasso Project, filed by Savary Gold in November 2015. (1) Karankasso Project – 9.2Mt @ 2.3g/t Au (at a 0.5g/t Au cut-off). The effective date (“Effective 1. Date”) of the most recent Karankasso Project JV mineral resource estimate that is supported by a technical report is October 7, 2015. For further information regarding that mineral resource estimate please refer to the technical report titled “Technical Report and ResourceEstimate on the Karankasso Project, Burkina Faso”, dated October 7, 2015 and prepared by Eugene Puritch and Antoine Yassa. Eugene Puritch and Antoine Yassa are employees of P&E Mining Consultants Inc. and are considered to be independent of Savary and Sarama. The technical report is available under Savary’s profile on SEDAR at www.sedar.com. Sarama has not independently verified Savary’s mineral resource estimate and takes no responsibility for its accuracy. Savary is the operator of the Karankasso Project JV and Sarama is relying on their Qualified Persons’ assurance of the validity of the mineral resource estimate. Additional technical work has been undertaken on the Karankasso Project since the Effective Date, including but not limited to, metallurgical testwork, exploration drilling and mineral resource estimation, but Sarama is not in a position to quantify the impact of this additional work on the mineral resource estimate referred to above.